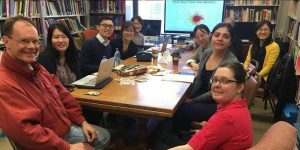 The LTRG has a long history at UIUC, with a tradition of meetings to discuss articles and issues pertaining to second language testing and assessment. Also occasionally featured are conference-paper practice sessions and talks by visiting language testing scholars. LTRG is by design and intent a graduate student-focused collective. Also participating will be Dr. Xun Yan (Linguistics), Dr. Scott Walters (Linguistics), Dr. Melissa Bowles (Spanish and Portuguese), Dr. Chillin Shih (East Asian Languages & Cultures) and Dr. Hyun-Sook Kang (Linguistics) as faculty advisors. We would like to cordially invite everyone who is interested in language testing to participate in our gatherings. Those who are interested in participating in LTRG, please send an email to Hannah Kim (hkim169@illinois.edu).